Painted Black or Antique Chestnut finish. NG to LP conversion kit. B Vent draft hood adapter. The perfect addition to any room. Available in direct or natural vent, this beautiful stove combines the elegance of a wood burning stove with the convenience of gas. Made in the USA to be one of the greenest stoves in America, the Defiant® is unlike any other wood stove on the market today. It adapts to your lifestyle, so you can choose to operate in catalytic or non-catalytic mode. 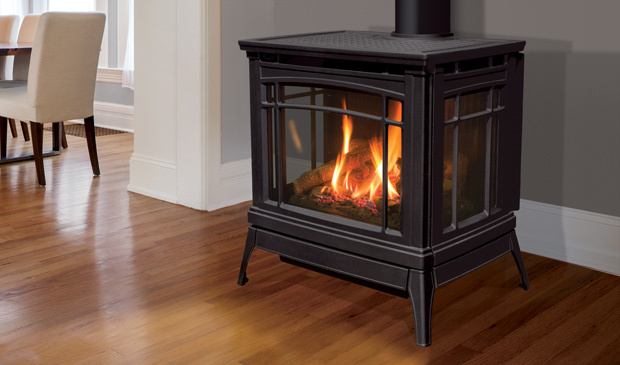 Slightly smaller than the Radiance® vent free stove, the Stardance® model offers the same ventless design, combining flexible installation and efficient heating into one convenient package.